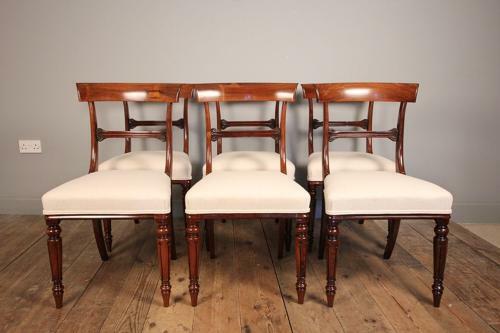 A super quality set of 6 chairs in solid Rosewood from the William IV period. These immaculate set in wonderful original condition, very firm jointed with no breaks or repairs. Having a highly figured timber throughout, with bar backs and newly upholstered natural linen stuff over seats, raised on a tapering tulip leg. Lovely colour and lustre throughout. English, Circa 1835.